Enjoy your 2nd Christmas day! The holidays are one of my favorite times of the year but unfortunately it’s also an expensive time… You need to buy a lot of gifts and finding good ones is difficult. But another problem is you wanna look good and maybe wanna impress somebody? So today I have some good tips for you where you can find some good promo’s at the jewellery. This is good for the finishing touch at you outfit but this is also good as a gift. 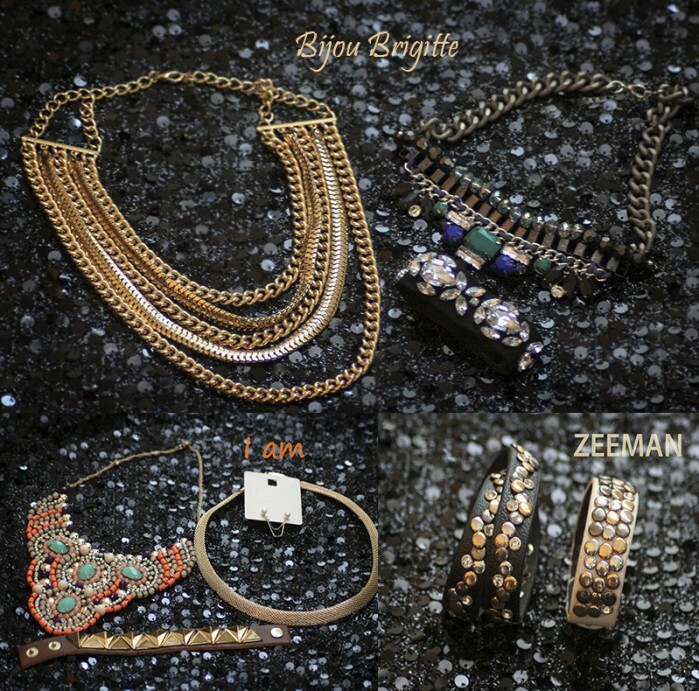 I’m also going to show you what I bought… Yes it’s much but a girl can never have to many jewelry. 😉 But the main reason that I bought so many was just because I did a great deal with the promotion. By Bijou Brigitte I found the best promotion! I was looking by the sale and then I saw that you get 50% off the sale price. So you can understand that this is a very cheap and good deal! I bought 3 items for €12… So that’s very cheap! Next shop is I am. Also there I found so good sale items! Two new necklaces, a bracelet and a special ear jewelry. I’m not going to say much about it, showing it is much better! The golden necklace and the earrings are one of my favorites this moment! The last shop is zeeman. I’m not visiting this shop much. But I needed something special to decorate and this was the only shop where I found it! But except that I found this beautiful bracelets! So I definitely wanna share this tip with you guys! For this two beautiful arm candy I payed all round €4. So that’s very cheap! I’m so in love with all my new jewelry! I hope you’ve got now some inspiration where you can score some good deals! Je hebt flink geshopt qua sieraden hihi, ik vind die van de Zeeman erg leuk!